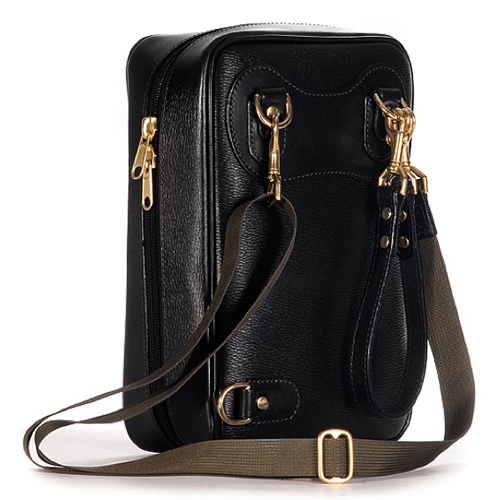 This compact bag design is ideal for small items like a cellphone, camera, wallet, or other articles of daily use you may carry. Construction Method: Turned finish – this method may be recognized by noting the lack of machine-stitching that is visible at points of assembly on the exterior side of the bag. This is possible by placing the material, or parts, face to face, machining and turning right-side out. It is the most commonly used assembly process. Design Tip: Match the colour and surface finish of the metal zipper head with the metal bag hardware. Designer Note: Coil molded nylon zipper chain allow you to make your own zipper lengths. Coil zips are more flexible making them excellent for going around corners. The slides run smoother than VF zippers. Use #5 Coil zippers for small handbags and other applications where a small coil zipper is what you need. #5 Chain is 5mm across the coil when closed. 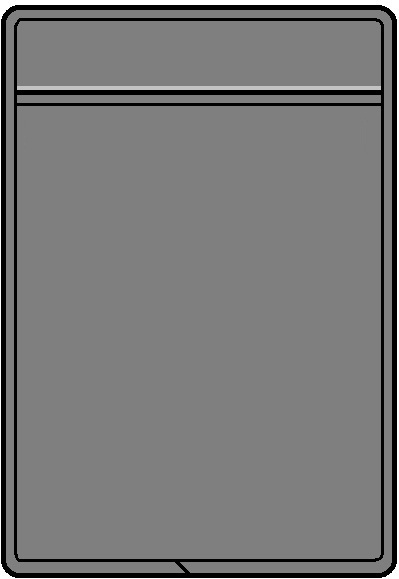 This is a patternless design (simple block grid). The pattern shapes can be measured and plotted out directly onto the leatherette or drawn on kraft paper to keep as a permanent record, then traced out on the fabric. Keep the corners rounded as this will allow for easier construction and stitching. You may follow the prototype’s proportions or use your own measurements based upon what you will carry in the bag (seam allowances are not included in the pattern). Designer’s Note: For smooth precise cutting, use a metal straight-edge and a sharp X-acto knife to cut the imitation leather. Only use scissors to cut round corners. This will provide a professional look to your project. Remember to add seam allowance to your pattern pieces. Cut one (1X) of each pattern piece except for gussets, cut 2X and for D-ring tabs, cut 3X. Also, cut a long strip of leatherette for a self-piped trim, 54” long x 1” wide (seam allowance is included in the width). Make Piping with Plastic Filler – To make up, cut a long strip of leatherette and of plastic cord to desired length plus a bit extra for finishing. Use double-sided seam mounting tape for the trim construction as pins will leave a trace. Place one piece of tape on the fabric’s long edge (WSU), and one piece down the center. Remove the release paper and stick the plastic cord on center without any twists. Then, fold the leatherette straight over and press the edges together. Sew along the edge of the filler. A cording foot is one of my favourite tools for this job to get professional results but you may use a roller foot as well. The leather and filler are controlled by the seam tape as they feed between the foot and the guide for a straight tight seam. Set piping aside. Make D-ring Tabs – To make up, place a piece of double-side seam tape down the center of the wrong side (back) of a leatherette tab. 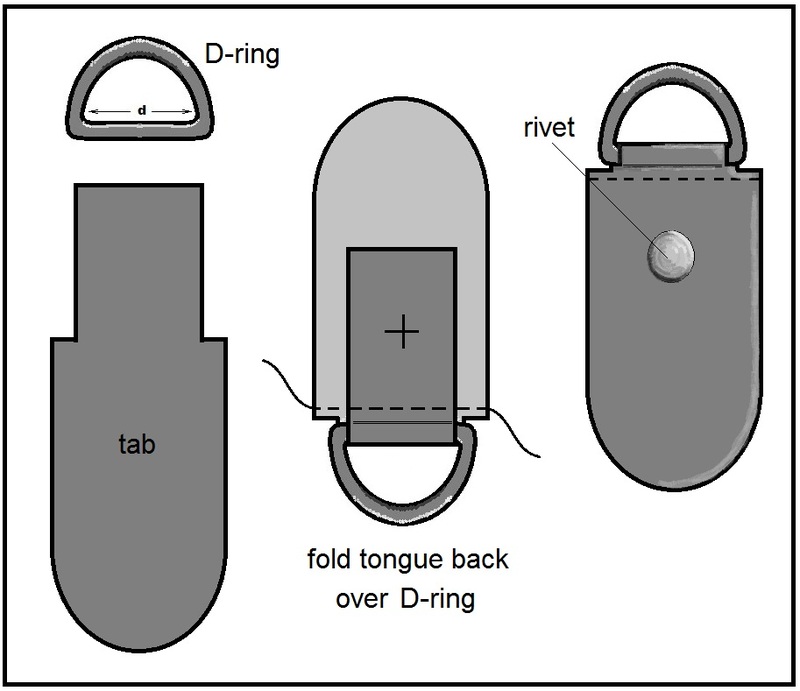 Slip a D-ring onto the tongue of the tab. Fold the narrow strip over the ring and peel away the release paper on the seam tape. Then, fold the leatherette straight over and press the layers together. Using a zipper foot attachment, stitch as close as possible to the D-ring across the top of the tab. Repeat 2 more times for the remaining hardware and set aside. Make the anchor pad – To add additional support to the hardware, reinforce the D-ring tabs by mounting it onto an anchor. Equally space two tabs apart onto the pad with both D-rings facing up and machine-stitch around the curved edge of the tabs. With the anchor FACE UP, secure a rivet through all layers below each D-ring to hold the thickness of the fabric together. Set aside. Make zipper – Cut a length of zipper chain equal to the length of the gusset (including seam allowance). Thread 2 zip slides onto the end of the zip chain, one after the other with the heads facing each other. Zip up the zipper to the other end of the chain (be careful not to slip off the coil as there is no stop). Then reposition the sliders to the center of the zipper. (The zipper should now be able to open and close in either direction). Tack across each end of the coil by hand to secure temporarily. Set aside. Make Hand Strap – To make up, place a piece of double-side seam tape down one side of the wrong side (back) of the hand strap. Peel away the release paper on the seam tape and fold the leatherette straight over and press the layers together. Topstitch around the perimeter of the strap. On each end of the hand strap, place a swivel latch clasp and fold over the fabric approximately 1 inch [25 mm]. Secure with 2 rivets through all layers to complete, following manufacturer’s directions. Set aside. Make Adjustable Strap – Slip the slider buckle onto the webbing, and then draw the end of the strap through the bracket of the swivel latch. Return the end of the webbing back through the slider and secure in place. On the other end of the strap, attach another swivel latch clasp by wrapping a remnant piece of leatherette, cut-to-size, around the hardware and sandwiching the webbing between the 2 layers of leatherette. Use double sided seam tape to hold in place and topstitch around all sides of the leatherette, finishing with an X-stitch across the tab. Reinforce the strap with a rivet in the center of the X-stitch. Set aside. Slip Pouch Prep – Trim the opening of the slip pouch by sewing a length of self-piping to the opening of the pocket (face sides together). Grade the seam allowance and turn under. With FACE UP, edgestitch along the piped edge of the pocket. Set aside. b) Slip Pouch/Pocket Construction – With FACE SIDES UP, align and match pocket on top of front section. Baste around three sides of pocket. c) Mount Hardware to Back – With FACE UP, position anchor pad onto placement line with the aid of some double-sided seam tape. Edgestitch around perimeter of the anchor pad. Next, align the remaining D-ring tab to its horizontal placement position with the hardware nearest the seamline and tape in place. Edgestitch around the curved edge of the tab. Secure a rivet through all layers below the D-ring to hold the thickness of the fabric together. 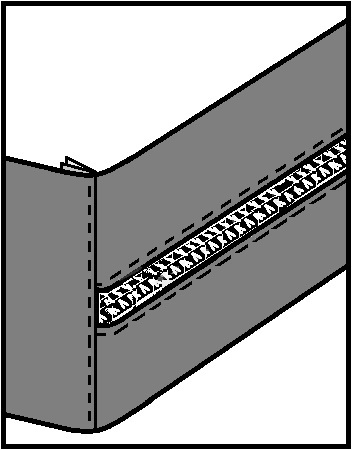 d) Gusset Construction – Insert zipper between the 2 gusset pieces and topstitch in place. Next, align and match the short ends of the zipper assembly to the short ends of the base section, with FACE SIDES together. Stitch ends to create a large continuous loop. 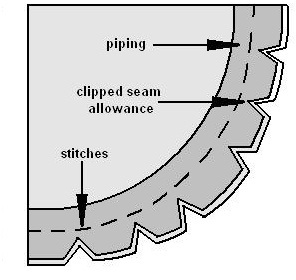 Grade seam allowances towards the base section. On FACE SIDE, topstitch along the seam on the base to secure the ends of the zipper coil. Set aside. e) Attach Gusset to Front & Back – Begin by opening the zipper (this is how you will be able to turn the bag right-side-out). With FACE SIDES together, align and match the gusset to the back section. 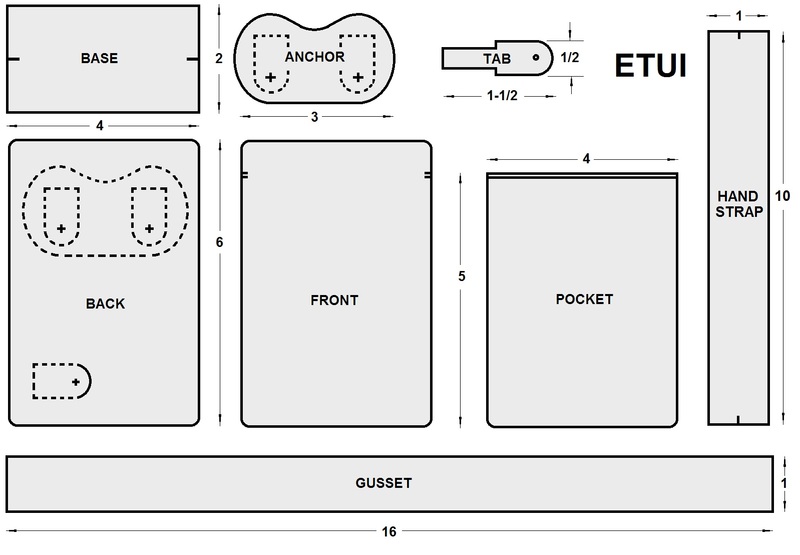 The base on the gusset should be below the sole D-ring tab. Follow the edge of the piping and stitch the 2 layers together. As the leatherette will not fray, you can clip into the corners to release the seam allowance if needed. You may wish to grade or sew together the seam allowances if desired. Next, repeat the procedure for the front section. 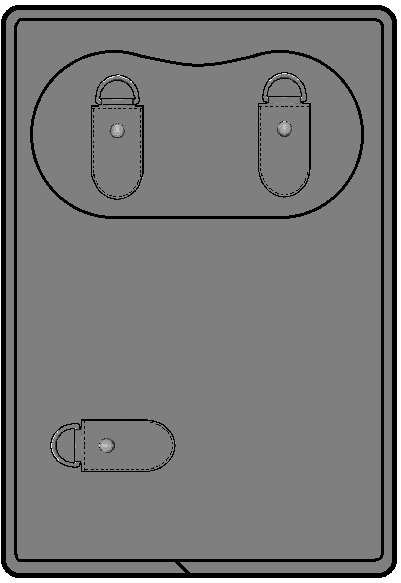 The opening of the pocket should face the seamline in the same direction as the anchor pad on the back. Gently turn the exterior of the bag out through the zipper opening and close the zipper. each end of the Hand Strap attached to the bottom D-ring. Another gorgeous design. Thanks you. This is such a beautiful bag! Alas, my sewing machine is too finicky to sew through even imitation leather. Here are a few tricks you can try….use a denim machine needle #16, try a roller foot, spritz a bit of silicone spray onto the faceplate, use heavy-duty/upholstery thread. Some bags sold outside pales in comparison to this! Gorgeous and thank you for sharing! Hi! I’m planning to make this as a camera case and so is there a way to add some sort of internal padding to the bag? Hi Sunny…you might try making a drop-in type lining for the interior using neoprene as your medium. Thanks Don. Would you know of good online tutorials on drop-in type linings? The drop-in lining method is the easiest to make. Basically, you are making it separately from the outside of the bag. These lining pieces are more or less square grids with the bottom corners cut out. This gives a lining the same size and shape as the body of the bag before being inserted into the bag cavity and attached to the opening. You are a very kind and talented person. Thank you so much for sharing your expertise. your instructions & diagrams are very clear and technical! thank you for taking the time to share this information! do you use a leather sewing machine [heavy duty] or normal household sewing machine? do you use leather needle? For the tutorials, I always construct the prototypes using a conventional domestic sewing machine modified with a dual-feed foot attachment and leather sewing needles if sewing genuine leather, otherwise I select the sewing machine needles based upon the raw materials used in the sample-making. Sorry Shermaine, I know of no do-it-yourself method. 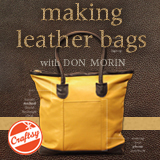 You might try a leathercrafter or luggage repair service. Just saw this on Pinterest through the Love to Sew website. Thank you for so generously sharing your patterns. Don, PLEASE continue to use pics AND diagrams? Thank YOU for being here. Also, please don’t stop this blog be cause of Craftsy. Thanks! Love you! Thank you for the kind words, Carol. Craftsy is not responsible for my design blog. My spin on it would be to attach the ETUI shape to a bandillro-style holster or strap. i want to be like you! absolutely love the design and explanations. thanks! Thank you so much for sharing this tutorial. I have to say I love to make this kind of bag. It gives me the whole front to draw on them but I have a problem. When I’m attaching the gusset part to the front or back I always have the problem of the gusset being to short or too long. I guess the measurements are okay ( I think ) the problem is after cutting the corners on the front and back panel I mess it up. I’m not sure what I’m doing wrong. Any suggestions would be deeply appreciated. Thanks again for sharing. This is only a guess Vicky as I have done this myself many times. It involves the attachment of the piping. Sewers tend to pull the piping taut to keep it flat while applying it. This cause a tension along the stitching line and shrinks the seam. Then when you join it to the gusset piece, suddenly it is no longer equal to one another even though you have measured and trued your pattern. So try inserting the trim very loosely and then try to assemble your etui bag. Just a thought!